This is one of a set of 11 Chinoiserie panels (Museum nos. P.6 to 16-1954) that was acquired by the Museum in 1954. It is not known which house they were originally intended for, but they relate closely to a set of similar panels painted in 1696 for a house in Botolph Lane, London. Very little is known about the painter and printmaker Robert Robinson and not much of his work survives, apart from the two sets of panels. The London panels are a mixture of Chinese and Peruvian scenes, whereas the set now in the Museum is mainly Chinese in inspiration. The panels' dramatic quality may be attributable to Robinson's work as a scene painter for the theatre. Throughout the 17th century goods from East Asia were highly fashionable. However, these painted panels are one of the earliest manifestations of Chinoiserie. The term denotes purely decorative fantasies produced by European artists and based roughly on East Asian themes, as opposed to imitation of true Chinese forms in such techniques as lacquer work. In these panels all manner of whimsical grotesques are mingled with reminiscences of Chinese, Tartar, and Indian themes. Oil painted panel with Chinoiserie decoration, showing a fantastic scene of a Chinese Empress in a canopied three-wheeled chariot, being drawn along by an elephant-like creature, in a mountainous landscape. From a group of at least eleven panels, painted in England for an unidentified house. It is not known which house this set of panels was originally intended for, but they relate closely to a set of similar panels, which were painted in 1696 for a house at 5 Botolph Lane, in the City of London and removed to Sir John Cass's Foundation Primary School, Aldgate, London, in 1906. Very little is known about the painter Robert Robinson and not much of his work survives, apart from these two sets of panels. Robinson's work anticipates the mania for Chinoiserie in England by 30 years or more. The Botolph Lane panels are a mixture of Chinese and Peruvian scenes, whereas the set now in the Museum is mainly Chinese in inspiration. Throughout the 17th century goods from the Far East were highly fashionable. However, these painted panels are one of the earliest manifestations of chinoiserie, i.e. purely decorative fantasies by European artists, based roughly upon Far Eastern themes, as opposed to imitation of true Chinese forms such as lacquer work. In the V&A panels all kinds of whimsical grotesques are mingled with reminiscences of Chinese, Tartar, and Indian themes. 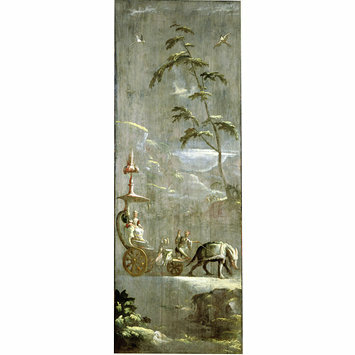 Oil painted panel with Chinoiserie decoration, [one of a set of 11] showing a fantastic scene of a Chinese Empress in a canopied chariot being drawn along by an elephant-like creature, by Robert Robinson, about 1696. The painter of these panels created scenes combining Chinese, Indian and Tartar influences. They reflect an English view of foreign places and peoples which confused accurate details with imagination and fantasy. The painter, Robert Robinson, was also a scene painter for the theatre and a mezzotint engraver. He may have designed these panels for a small room containing a collection of lacquer or porcelain.